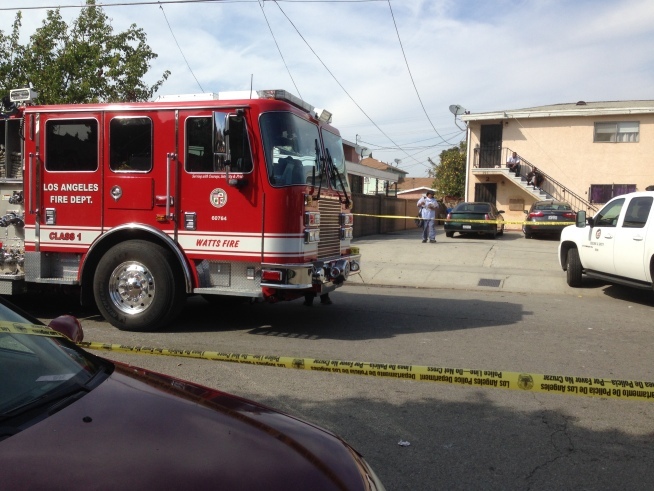 A fire left a mother and child dead in Los Angeles on Wednesday, March 5, 2014. It was the 11th fatal fire in 2014. Arson investigators were sifting through the rubble Wednesday of a fire that left a mother and her 2-year-old child dead, officials said. Gordon Tokumatsu will have a full report on the NBC4 News at 5. The fire broke out before noon Wednesday in the 170 block of East 50th Street. It took 30 firefighters 9 minutes to douse the blaze. The fire broke out in a cluttered converted garage -- one room with a kitchen and a bathroom. It was not immediately known if there was a working smoke detector, fire officials said. The clutter prevented firefighters from initially getting all the way inside, said Deputy Chief Joseph Castro, with the Los Angeles Fire Department. Little was immediately known about the victims. A neighbor described the woman only as Nancy and said she was a quiet, happy loving mother. She lived there with her boyfriend and two young sons. The deaths are the 10th and 11th this year, a rate far outpacing the 2013 total of 20 fire deaths. An 89-year-old World War II veteran was killed in a house fire Feb. 21 in the Mt. Washington neighborhood of Los Angeles. An 80-year-old woman died in a fire Feb. 8 in the 250 block of East 47th Place. In January, a fire in a detached garage claimed the life of a 61-year-old man in Winnetka.